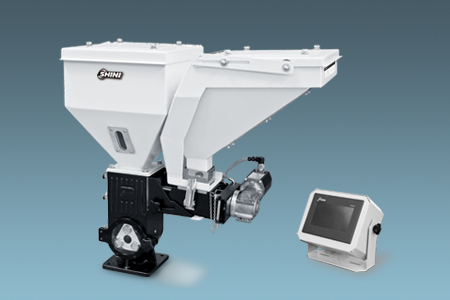 SGD series dosers are suitable for auto-proportional mixing of virgin material, regrinds, masterbatch or additives. The motor with gear ratio of 38:1 is coupled to a dosing screw of 12, 14 or 16mm in diameter to give a total of three models with the output ranging from 0.04~32kg/hr. Double color dosers can be assembled from two single color dosers according to customers, requirements. Dosing screws are chrome plated for durability. Unit is comprised of standard modules for ease of cleaning, disassembly and interchangeability. Three-tube hopper magnet is equipped at the base to absorb metal impurities so to prevent screw of molding machine from damage. 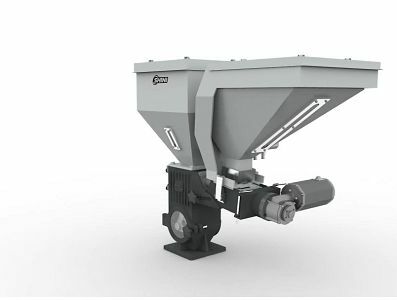 Mixer is standard equipment for double color doser to make the material evenly mixed, while also an option for single color doser. Main material hopper is standard equipment for double color doser. It is optional for single color doser. External signals can be directly interfaced with control box. The current operation mode can be recorded, unaffected by power failure so operation would be returned to normal when power is on. Forced material cleaning is convenient to replace masterbatch. SGD is able to automatically monitor the addition of masterbatch and additives. Also it can fulfill automatic calibration when bulk density of material varies. Ethernet communication is available to transmit data, record and store the dosage of regrinds and masterbatch for future use. The function of aberration compensation is able to adjust the proportion of masterbatch or additives based on regrinds amount. Manipulate dosing process via loss-in-weight technology, satisfying the high requirement of production precision. Up to 100 groups of recipes can be saved. Suitable for extrusion or injection molding modes. It is able to detect the blockage and overload of masterbatch and stop machine and sound alarms accordingly. Machine halts and sounds alarm when motor faults. For working with SHD-100 or SHD-160U and models above, heavy base should be selected.